I’d like to present for your pleasure and interest a Japanese World War II propaganda cartoon. This is a cartoon originally from 1943. Japan was still “winning” the war; a year and a half beforehand, the Japanese Imperial Navy had attacked Pearl Harbor. But by the time the full length movie came out, in 1944, things were looking deeply grim for the Japanese Empire. In this cartoon, the Pearl Harbor event is re-enacted. The cartoon is called Momotaro’s Divine Sea Warriors. This is the entire feature length cartoon. The cartoon is not nearly as bloody and gutsy as American animation was at the time, but you can sense the subtleties of the Japanese mindset and just how “dark” a society Japan really was at the time (I still think, in many ways, Japan is a very “dark” country… But that’s a post for another time). Momotarō: Umi no Shinpei (桃太郎 海の神兵, lit. 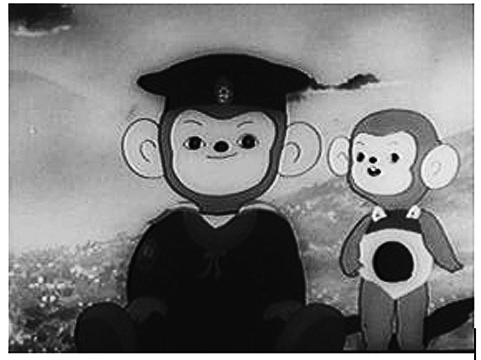 Momotaro’s Gods-Blessed Sea Warriors or Momotaro, Sacred Sailors) is the first Japanese feature-length animated film. It was directed by Mitsuyo Seo, who was ordered to make a propaganda film for the war by the Japanese Naval Ministry. Shochiku Moving Picture Laboratory shot the 74-minute film in 1944 and screened it on April 12, 1945. It is a sequel to Momotarō no Umiwashi, a 37-minute film released in 1943 by the same director. It is black and white. Plot: After completing naval training, a bear cub, a monkey, a pheasant, and a puppy say goodbye to their families. Like the prior film, the movie features the “Peach Boy” character of Japanese folklore. The film is about the surprise maneuver on Sulawesi island, depicting parachute troops’ actions. The monkey, puppy and bear cub are the ones that become parachute jumpers while the pheasant becomes a pilot. The whole movie also depicts the Japanese “liberation of Asia“, as proclaimed by the Government at the time. There are some musical scenes. Of note is The Song of AIUEO (アイウエオの歌AIUEO no Uta), a scene where Japanese soldiers teach local animals how to speak. Background: The Naval Ministry previously showed Seo Fantasia, a 1940 Disney film. Inspired by this, Seo tried to give dreams to children, as well as to instill the hope for peace, just as he did in the prequel movie, Momotaro’s Sea Eagles. The Song of AIUEO (アイウエオの歌 AIUEO no Uta) is famous for being given a homage in the series Kimba the White Lion (ジャングル大帝 Janguru Taitei) by Osamu Tezuka (Tezuka watched the film in April 1945. He later said that he was moved to tears by the movie’s hints of dreams and hopes, hidden under the appearance of war propaganda). For a long time, the film was presumed to have been confiscated and burnt by the American occupation. However, a negative copy of the film was found in Shochiku’s Ofuna warehouse in 1983 and was re released in 1984. A reproduced movie was later screened and the VHS package is now available in Japan. So, without further ado, here is the cartoon Momotaro’s Divine Sea Warriors in it’s entirety. If you just want to get the gist of the film, I suggest watching the first part and the very last part… The lunacy of war. Why do we do this?